Use only fabrics that are woven checks or woven stripes. Printed designs aren't accurate enough for quilting. Here's how you can tell the difference: a woven fabric shows the design on both sides, although one side may look like the reverse. The printed fabric isn't printed on the backside, so the checks or stripes are only on one side. The blue fabric here is woven; the red fabric is printed. Trim the selvedge edge off the area you want to use. Then cut the fabric at any stripe or check line close to the 10 1/4 inch size. Lay it on the cutting board and rotary cut it to the 10 1/4 by 10 1/4 inch size. 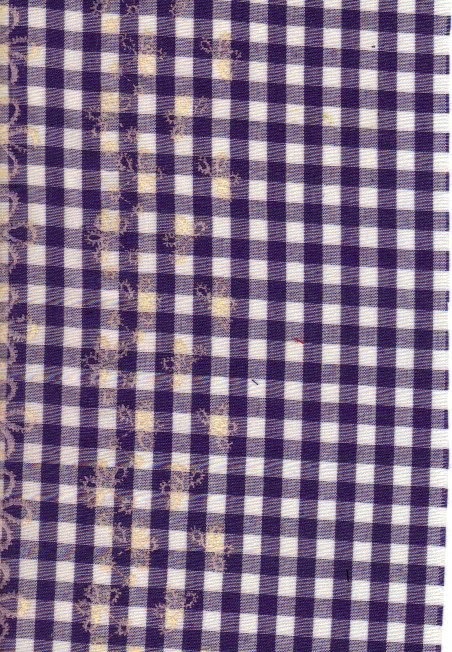 Stripes and checks require exact squares or the design will look like it goes uphill or downhill. Check your work by folding it diagonally to see if the tips meet with no excess on the side. If not, go back and measure again. If it folds into a diagonal with no extension on the side, you should have a perfect square. Match background colors. Stripes and checks together can work, but the real key to making it attractive is to have the same color background on each piece. (Ours don't match well here.) If your backgrounds aren't similar shades of white, ecru, or gray, the colors never look as good as those that match. Practice with stripes or checks. What happens when you use a stripe to make a quarter-square triangle block? I made a couple of samples, starting with a 10 1/4 inch square. This will create a 9 inch block when finished. 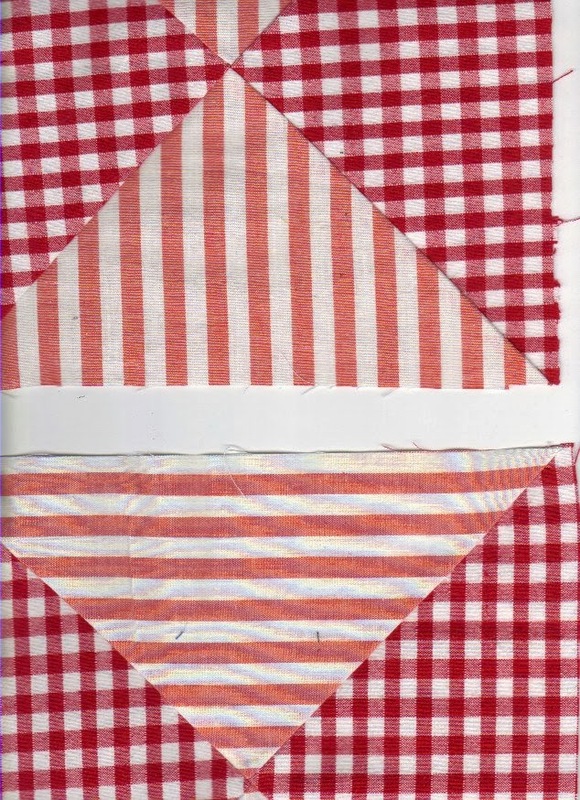 Once you have a 10 1/4 inch square, cut it on the diagonal to make four individual triangles. You'll see that the triangles will fit together to make a square, but the design won't be attractive without cutting another square and dividing it into triangles the same way. 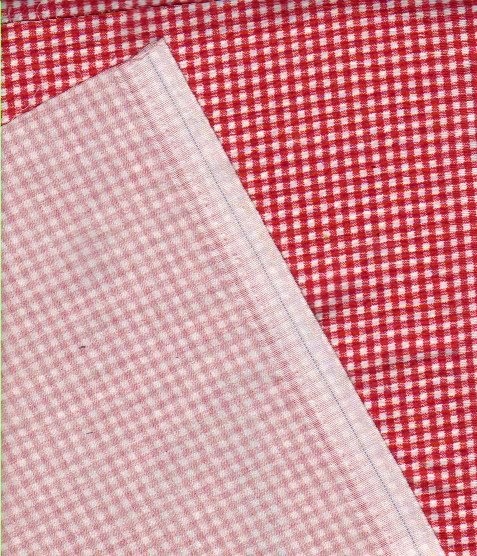 Cut a solid color, a print, or even a checkered fabric for the second fabric for your quilt block. Alternate the two sets of triangles, making sure that if you're using stripes, the two triangles you use go in the same direction. (You'll have two horizontal pieces and two vertical stripes.) Press the blocks and trim the corners. Press your pieces to one side, not open like regular sewing. I always try to press toward the darker fabric so the dark doesn't show through a light one. This is especially important if you're working with polyester and cotton. 100 percent cotton is a little heavier, so the seams don't show through as much. 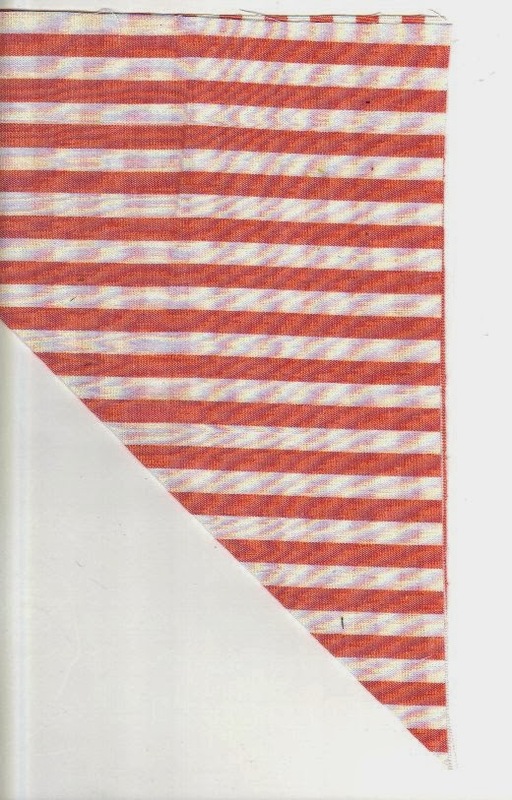 Here's another sample with stripes only, all going in the same direction. The stripes were cut horizontally, but when made into the quarter-triangle block, show as diagonals. 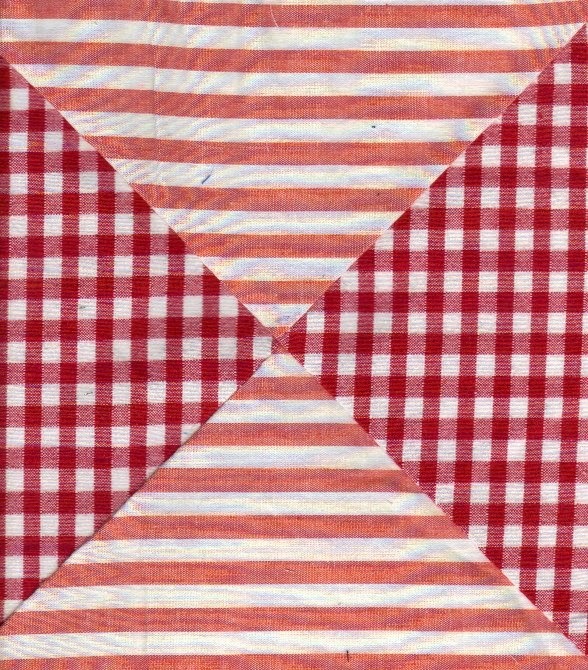 When you use stripes or checks, the quilt blocks seldom look attractive side by side, even if you use a solid color for alternates in the blocks. Solve this with sashing or a strip of fabric dividing the blocks so the eyes see each block individually. I left a space between blocks here so you can see how they would look with a strip between, but you can also see that they don't please the eye side by side. 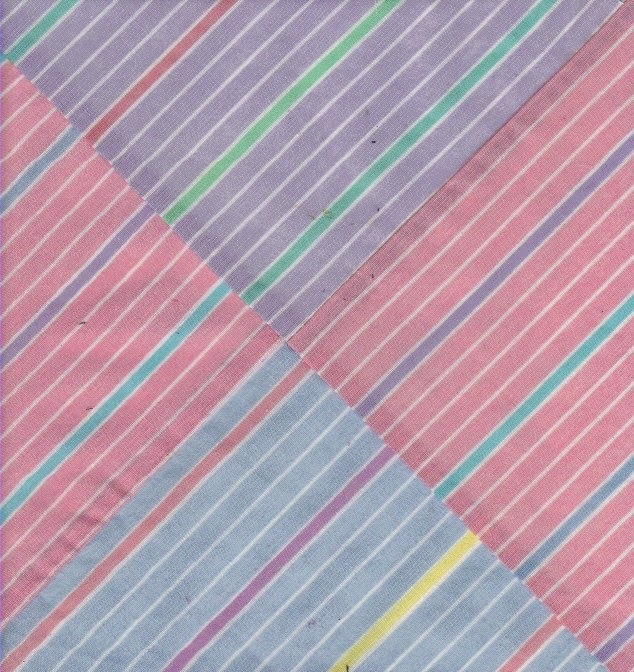 Half-square triangle blocks make interesting designs with stripes, particularly when using four squares together to make a pinwheel. Here's a much better look. The white background of the stripe matches the white of the solid fabric. The design doesn't flow over from one piece to the other, and you can turn the stripes in different directions for other effects. This block has a problem, though. 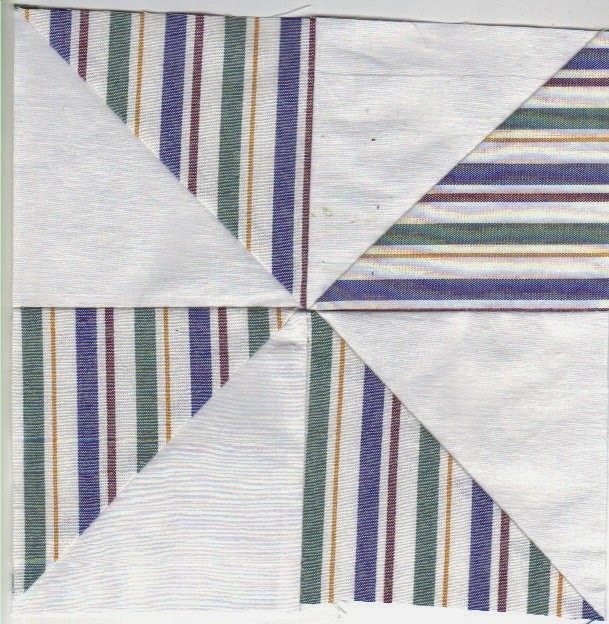 The bottom left striped piece should be a horizontal stripe to create alternating vertical and horizontal stripes. These are the kinds of issues you can learn about from making a few practice blocks. White background quilts are fashionable today, much like they were in the early 20th century. We're seeing white backgrounds on quilts shown on several of the 2014 quilt magazines, so don't hesitate to use white when it works to please the eye. Have you seen this quilt? You may be able to solve a murder mystery. Until next time, enjoy crafts while the weather is cold. Make the best of your time indoors.